We will solve different types of problems on height and distance with two angles of elevation. Another type of case arises for two angles of elevations. PQ be the height of pole of ‘y’ units. QR be the one of the distance between the foot of the pole and one of the observer’s point with QR = ‘x’ units. QS be the another distance between the foot of pole and other observer’s point with QR = ‘z + x’ units. PR be the one of the line of sight as ‘a’ units and PS be the line of sight as ‘h’ units. Let ‘θ’ be one the angle of elevation whose line of sight is PR and ‘α’ be the angle of elevation whose line of sight is PS. tan θ = y/x; cot θ = x/y. Another similar type of case for two angles of elevation is that when two people are looking at the same tower from two opposite sides. Let PQ be the tower of length ‘y’ units. RQ be the distance between foot of tower and one of the observer’s position of ‘x’ units. QS be the distance between foot of tower and another observer’s position of ‘z’ units. PR be the one of the line of sight of ‘h’ units. PS is the line of sight of ‘l’ units. 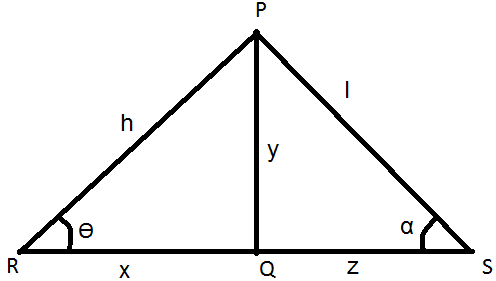 Tan α = PQ/PS = y/z; cot α = PS/PQ = z/y. Now, let us solve some examples based upon above explained concept. 1. A man is standing at a distance of 10 m from a tower of height 20 m to left of it. Find the angle of elevation when the man looks to the top most point of the tower. Another man is standing at a distance of 40 m from the foot of the tower on the same side. Find the angle of elevation in this case. 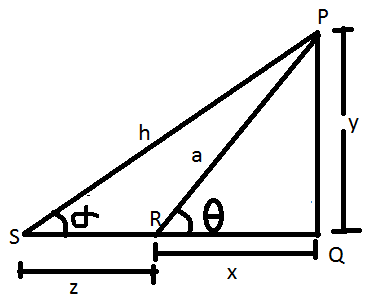 Distance between tower’s foot and another observer, QS = z = 40 m.
(i) distance between foot of tower and first observer. (ii) Distance between foot of tower and second observer. ⟹ tan θ = PQ/QR = 30/x. Hence distance between foot of tower and first observer = 20.27 m.
Hence, distance between foot of tower and 2nd observer is 17.32m.